Inoki met Rikidōzan at the age of 17. He went back to Japan for the Japanese Wrestling Association (JWA) as Rikidōzan's disciple. One of his dojo classmates was Giant Baba. After Rikidozan's death, Inoki worked in Baba's shadow until he joined the original Tokyo Pro Wrestling in 1966. After a long excursion of wrestling in the United States, Inoki found a new home in Tokyo Pro Wrestling. While there, Inoki became their biggest star. Unfortunately, the company folded in 1967, due to turmoil behind the scenes. Returning to JWA in late 1967, Inoki was made Baba's partner and the two dominated the tag team ranks as the "B-I Cannon", winning the NWA International tag team belts four times. Wrestling legend Bruno Sammartino tells a story about Inoki trying to "shoot" on him during a tag match in Osaka to build his reputation against the then-world champ. Bruno powered out of the hold, pounded Inoki mercilessly and threw him out of the ring. Inoki refused to re-enter the ring with Sammartino and tagged in Baba to finish the match. Fired from JWA in late 1971 for planning a takeover of the promotion, Inoki founded New Japan Pro Wrestling in 1972. His first match as a New Japan wrestler was against Karl Gotch. In 1995 the Japanese and Korean governments came together to hold a two-day wrestling festival for peace in Pyongyang, North Korea. The event drew 150,000 and 190,000 fans respectively to Rungnado May Day Stadium. The main event saw the only match between Inoki and Ric Flair, with Inoki coming out on top. Days before this event, Inoki and the Korean press went to the grave and birthplace of Rikidōzan and paid tribute to him. On November 30, 1979, Inoki defeated WWF Champion Bob Backlund in Tokushima, Japan to win the title. Backlund then won a re-match on December 6. However, WWF president Hisashi Shinma declared the re-match a no-contest due to interference from Tiger Jeet Singh, and Inoki remained Champion. Inoki refused the title on the same day, and it was declared vacant. Backlund later defeated Bobby Duncum in a Texas Death match to regain the title on December 12. As Inoki refused the title his reign is not included nor is it recognized by WWE in its official history, and Backlund is recognized as having one reign from 1978–1983. Inoki's retirement from professional wrestling matches came with the staging of the "Final Countdown" series between 1994 and 1998. This was a special series in which Inoki re-lived some of his mixed martial arts matches under professional wrestling rules, as well as rematches of some of his most well known wrestling matches. Inoki faced Don Frye in the final match of his professional wrestling career. 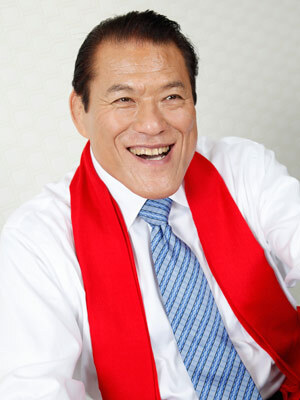 Culminating in 2006, Inoki's influence within New Japan declined. An example of this has been the purchase of his image by Yuke's, who in 2005 purchased his controlling 51.5% stock in New Japan. As a result New Japan is now able to control Inoki's appearances and the use of his image. Inoki began a new promotion in 2007 called Inoki Genome Federation that competes with New Japan. 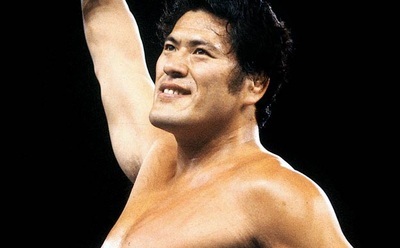 On February 1, 2010, World Wrestling Entertainment announced on its Japanese website that Inoki would be inducted into the WWE Hall of Fame as part of the Class of 2010. 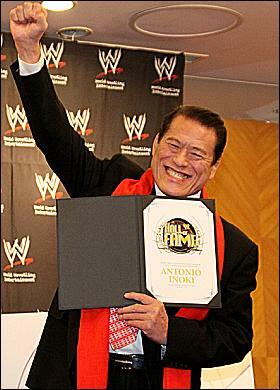 On February 9, WWE held a press conference in Tokyo, Japan to officially announce the induction, making him the first ever Japanese person to receive the induction.Inoki was presented with a Hall of Fame certificate by WWE's Ed Wells and stated that he would be attending the WrestleMania XXVI weekend festivities, which saw him officially inducted by Stan Hansen.